Dr. Chaos is an action-adventure game originally released in Japan for the Family Computer Disk System in 1987 by Pony Canyon. An English localization was produced for the NES that was released in North America by FCI in 1988. The full title of the Japanese release was called Dr. Chaos: Jigoku Tobira (Dr. CHAOS 地獄の扉, Dr. Chaos: Jigoku Tobira? lit. Dr. Chaos: Door of Hell). 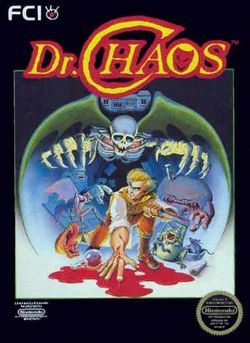 The player assumes the role of Michael Chaos, brother of mad physicist Dr. Ginn Chaos, who has been doing Warp Zone experiments in his mansion and gone missing. Armed with only a Knife in the beginning, as Michael moves through the house, he can pick up Handgun Bullets, Machine Gun Bullets, Grenades and life-replenishing Yellow Vitamins and Red Vitamins. There is a menu which has four options, open, get, go, and hit. There are 11 Warp Zones in all. At the end of each of the first 10 Warp Zones, Michael must fight a large monster that carries a piece of the Laser and guards a valuable piece of equipment, the latter consisting of the Ultra Space Sensor, four Life Bottles, the Air Helmet, the Jump Boots, two Blue Vitamins and the Shield Suit. Once Michael fully assembles the Laser, he'll be able to challenge the final boss, Canbarian. This page was last edited on 17 November 2013, at 04:14.